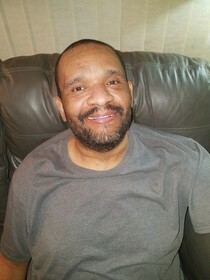 Obituary for Duane Russell | Minor-Morris Funeral Home, Ltd.
Duane C. Russell of Joliet, Illinois passed away on February 5, 2019 at Presence Saint Joseph Medical Center after battling Parkinson’s disease. He was born July 1, 1972 in Joliet, Illinois to Curtis Russell, Sr. and the late Joyce Russell and was the youngest son born to this union. Duane accepted Christ at an early age and attended Mt. Zion Baptist Church with his family. He enjoyed baseball and was a die-hard Cub fans and Chicago Bears fan. He also enjoyed listening to music, re-runs of the Martin Show and the Wayans Brothers sitcom and cooking was his life. Duane was particularly fond of racing cars. He could always be seen enjoying a Kit Kat candy bar. During his illness, he yet remained independent and never looked for help or pity from anyone. He graduated from Joliet West High School. He went on to graduate from Joliet Job Corp. He then moved to Las Vegas, NV to further his culinary arts passion. He attended Le Cordon Blue College of Culinary Arts in Las Vegas. Duane worked at the Orleans Hotel and Casino in Las Vegas, Nevada. Duane can be remembered by his loving, bright smile and sweet personality. Duane is preceded in death by his wife, Dana Russell; mother, Joyce Russell; brother, Curtis Russell, III and his aunt, Margaret Ann Johnson; and grandmother, Velma Broadway. He leaves to cherish his beloved memories to his daughter, Kareena Russell of Las Vegas, NV; father, Curtis Russell, Sr. of Bay Springs, MS; brother, Curtis Russell Creal of Joliet, IL; maternal grandfather, Berk Broadway, Sr.; sister-in-law, Carla Moore-Russell of Plantation, FL; three nephews, Curtis Russell IV of Joliet, IL, Calvin Russell and Carter Moore-Russell; a host of loving cousins, childhood and newly found friends.